You’ll be surprised how good everything are inside the room, love this hostel and highly recommended! Big comfy beds in the dorm. Really nice bathrooms and showers. Downstairs area was social and had lots of people chilling in it. 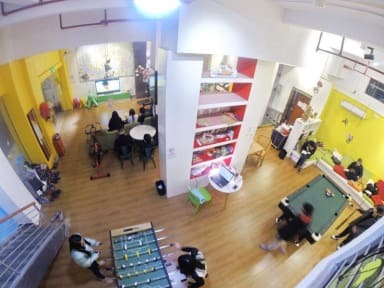 Really good hostel! Had a great time meeting people. They have a good selection of beers and games. The wifi worked great, which was great for relaxing in my room after a long day. I don't have any complaints about the facilities. The bar is great!! We can buy beer Lao. It is the greatest beer in Southeast Asia. The hostel has a separate building with its own entrance and a big common room which is nice! And they also sell stuff like bear without a big markup:) Also like 5 minutes walk from the metro station I had a room for 3 people and the beds there were big and quite comfortable. Cheap but the room is quite humid and not very clean. Facilities are old. It’s walkable from the metro station which was a plus. The proposition of locals was higher than expected, having that said the cleanliness of the hostel was not that good and there were people smocking near to the rooms all the time. It is good for sleeping, but if you are travelling and want to meet other people this is not the place for you. 1/ the odor. As soon as you walk in the odor is overwhelming. You guys have a cute dog that’s loose and that’s fine but the smell should be managed. 2/ I know it’s a hostel but the areas should be a little cleaner. Gross to sit down and relax 3/ rooms have HORRIBLE beds. People are in China usually to be on the go; whether for touring or business. The beds are completely sunken in and horrible or they are hard as a board. Sorry. I prefer being honest.